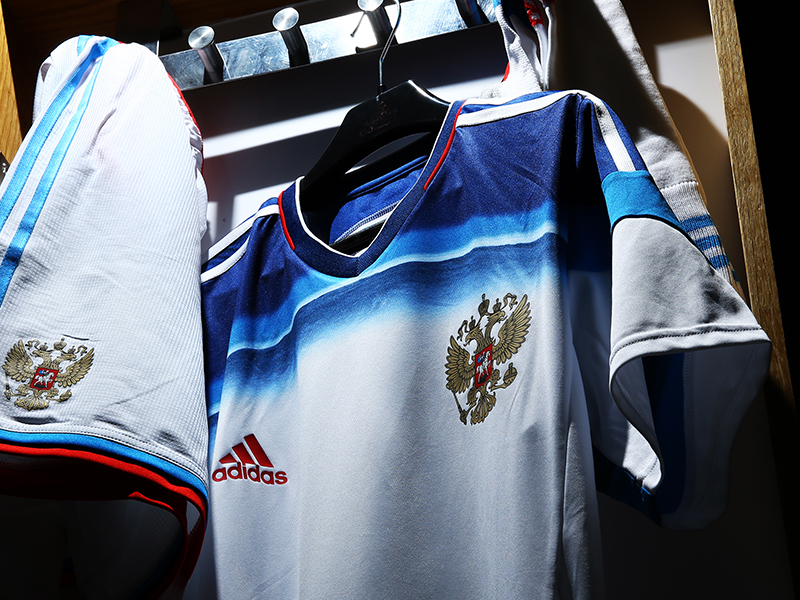 adidas presents the official away kit of the Russian national football team, in which the players will perform during the World Cup 2014 in Brazil. The innovative feature of the uniform is its incredible lightness. The net weight of the uniform set is only 320 grams, which is 40% lighter than the previous one in 2012 (510 grams). The other special features are the unique design, inspired by the achievements of Russia in exploring space and latest technologies that have been used in the kit production. With the new kit Russian football players will easily cope with the physical activities even in difficult conditions of hot weather and intense trainings. The national kit was designed by using adizero technology, which makes it more comfortable to wear as it weighs less and fits better thus helping the players to be faster in their movements. The uniform is made from a special compressive material that stretches in the areas where it is most needed thus giving good support to muscles and great breathability. The Earth Scientific Monitoring Center took part in the developing process of the kit and delivered unique pictures of Earth, taken from the Russian space satellite 'Electro-L' #1, to adidas. The outline of the Earth was modified and placed on the t-shirt, now it looks like a light blue semicircle. According to the idea of adidas designers, this image shows same perspective from which Yuri Gagarin (the first man in space) saw Earth in 1961. There is the adidas logo and the Russian national emblem of the Double-Headed Eagle below the print. The collar is made using the Russian flag colors and the basic white color of the kit is meant to be associated with the traditional color of the space suites and the color of the clouds which the space explorers see from the above. The design of the away kit as well as the design of the home kit is also inspired by the achievements of the Soviet astronauts in the 1960s. The Russian National away set was presented in November 2013th. The new kit embraces the pride of the Russian fans for their team, which will be supported by the whole country at the World Cup 2014 in Brazil. Together with the national team adidas aims to engage the youth into sports and motivate them to achieve the greatest goals.